Windows 7 as well as Windows Vista supports creation of fairly comprehensive power plans. A power plan is nothing but a collection of hardware and system settings that allow you to balance system performance with power consumption. Out of the box three power plans are provided – High Performance, Balanced and Power Saver. You can tweak each of these plans or even create a new plan from scratch according to your requirements. Obviously High Performance (or even Balanced) power plan is suitable for use when the system is connected to a AC power source. However, if you use the High Performance power plan while traveling, Windows is going to eat through your battery’s charge in no time. Unfortunately, due to some inexplicable reason, Microsoft didn’t include any provision for automatically switching power plans based on the power source. 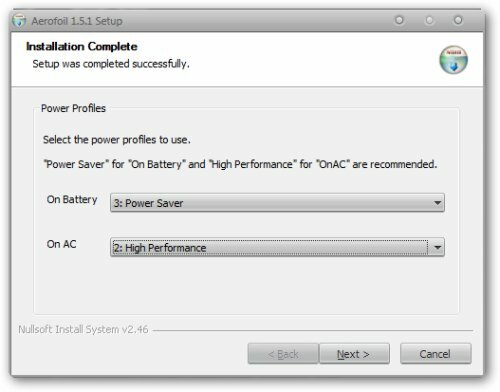 Last year, I had reviewed two utilities that allows you to do just this – Notebook Hardware Control and BatteryCare. NHC includes tons of handy options, and is a handy utility for laptop users. However, if all you want to do is automatically switch power plans, then it will almost certainly be an overkill. AeroFoil is a tiny utility, which silently operates in the background, and simply changes the power plan depending upon the power source. During installation, you will be asked to chose the power plans you want to use while on AC power and while on battery. After that AeroFoil will do it’s job automatically. The utility is super lightweight – it consumes negligible CPU cycles and requires just about 2MB RAM, and the switching of power plans is automatic and near instantaneous. The power saver plan switches all peripherals (such as processor, WiFi adaptor and fans) into power saving mode to conserve power. Additionally, AeroFoil disables Aero effects while on battery. The combination of the two allows AeroFoil to significantly increase your existing battery’s backup time. thanks for sharing…i was in need of a tool like this..
Yep, this can be especially helpful for me when I’m in the college. Nice I am going to check it out now. I like how it doesn’t eat up your CPU usage. what does the inbuilt power function do then , that comes with the laptop …. The powersaver mode mostly throttles various devices and peripherals to reduce power usage, besides optimising some system parameters. However, it doesn’t turn off Aero, and most importantly, windows doesn’t automatically switch power plans. Thank you, this was very useful. Pretty cool to see Windows 7 improving this area, I am still on Windows XP so things like this might make it even better for me to switch over. This will really help when traveling. I never realized that they had programs like this to help manage the power settings. These are the kind of practical utilities that should have come with Windows a long time ago. But it’s good to see them incorporating it anyway, as they are quite useful and prevents having to scourge for 3rd party apps for the same purpose. Thanks a lot. This is Nice Tip. This will really help when on travel. I have been looking for something to help me manage this better, I will have to check into this. Thanks for the info.